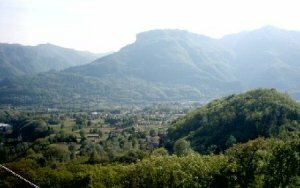 1014 Pleasing apartment in a residential area of Barga (Lucca) with private gardens and access. In a residential area in Barga, near the public swimming pool and the stadium, an apartment of approx. 150mq which has independent entrance and plant design. The apartment is part of a four-family house which has recently built, with anti-seismic structure in reinforced concrete, provided of two exclusive spaces. Ground floor – composed of a c*overed lean to, used as car space*, basement, linked to the upstairs via a wood stairs, a small bathroom and a small garden on the back. First floor – the access is via an exclusive outside stairs. This level consists of a large living room with fireplace and stairs which links to the second floor, and a kitchen/ dining room. Second floor – Hallway, three bedrooms and a bathroom. The property has oil fueld central heating and in the immediately vicinity there is the possibility of linking to mains gas.